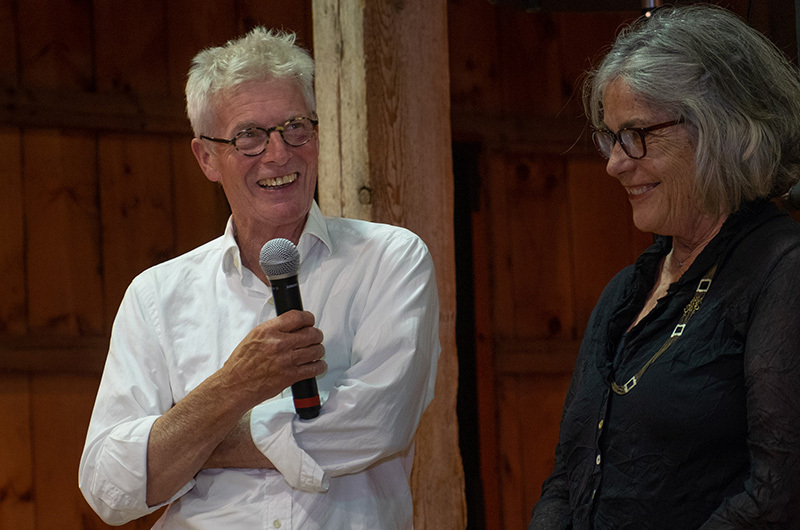 Allen and Lynne Whiting at the Saturday night screening of the documentary film A Painter Who Farms. Is Allen Whiting a farmer or a painter? 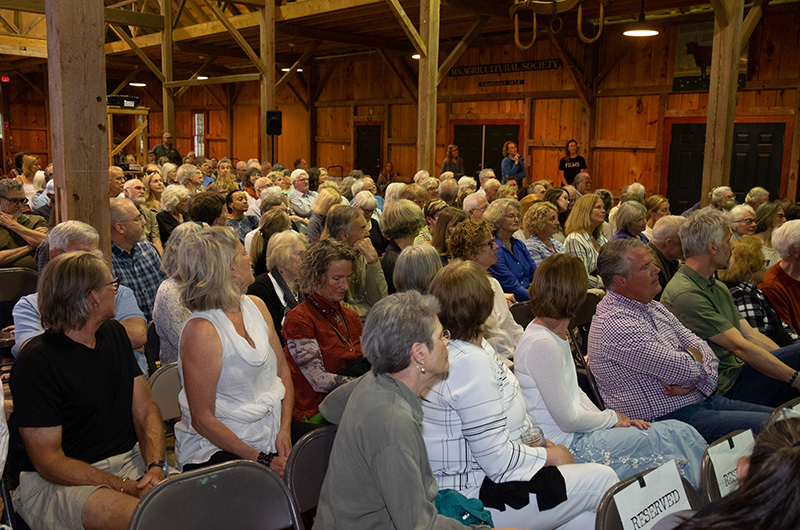 That is the question asked by many in the documentary film A Painter Who Farms, shown by the Martha’s Vineyard Film Festival at the Agricultural Society in West Tisbury this past Saturday. While the question elicits a variety of answers, Granary Gallery owner Chis Morse sums it up in the first few minutes of the film. “Is he a farmer or a painter? He’s someone that balances both very well,” Mr. Morse says. That balance is something Mr. Whiting has been practicing for a long time, all while harvesting both crops and inspiration from the Island’s land. The documentary, produced and directed by Barbarella and David Fokos, takes a closer look at Mr. Whiting’s journey, and how his love of painting and farming meld together to create a plethora of picturesque moments. These moments also work to reveal Mr. Whiting’s character—one of a man who in addition to being a “painter who farms” is a devoted father, husband, grandfather, jokester and hopeless romantic. 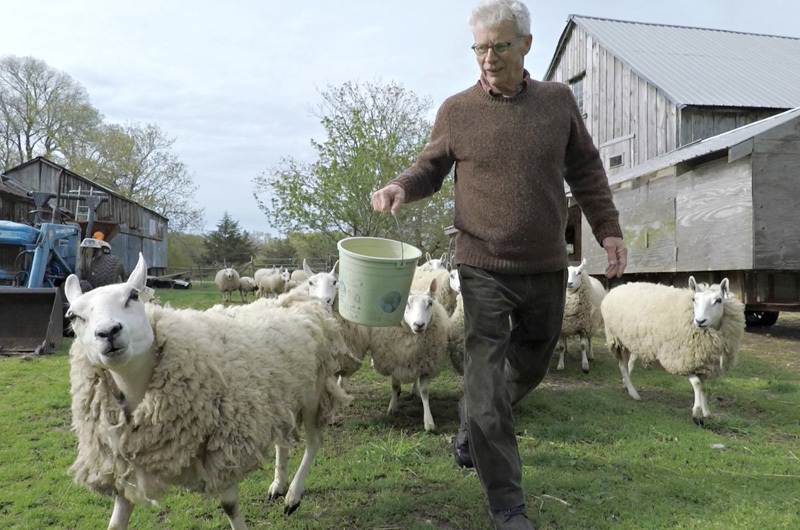 The romantic in Mr. Whiting makes himself apparent on-screen in many facets, whether he is carefully cleaning his paintbrushes, spreading feed for the 30 sheep racing around his property or recalling stories of his family, who has been living and farming on the Vineyard for 12 generations. In one particularly tender moment, Mr. Whiting reads his favorite poem penned by his grandmother, Emma Mayhew Whiting. “Oh who I, Lord, am I/That I should have the sea and sky.../For Thou in kindness destined me/To love my meadow by the sea,” Mr. Whiting recites, nestled closely to his wife Lynne in their West Tisbury home. For Mr. Whiting, that meadow by the sea is Black Point, an up-Island getaway of which he says he’s gotten “two to three hundred” paintings out of in the last 40 years. The camera pans to the water lapping up onto the peanut butter colored sand and then back to Mr. Whiting who’s capturing it all, one delicate brush stroke at a time. Mr. Whiting can also be seen searching for those answers on his farm in West Tisbury, although he’s not often alone in that setting. Mrs. Whiting or his grandson Asa are shown accompanying him — whether collecting fresh eggs, going for tractor rides, or moving hay, the farm is a family affair. The farmland also houses Mr. Whiting’s studio, a robust wooden structure filled with easels, paint cans, and acrylics in every color. The paintings crafted in this space often end up in the Davis House Gallery, an expanse in the Whiting’s home first opened by the couple in 1982. This summer, the gallery will open to the public beginning July 1. Mr. and Mrs. Whiting participated in a discussion following the film, moderated by Mr. Whiting’s longtime friend Chris Murphy. Many audience members voiced their fondness of his work as well as their gratitude for capturing the spirit of the Island. Brian Athearn, president of the Agricultural Society, offered a different kind of thanks.